CSS Menu Drop Down Maker 1.0 - Download Win Apps. Add professionally-looking css menu dropdown to your website in an easy way!. This CMDDM is an advanced tool that creates css menu dropdown menus on your website without JS/CSS hand coding. 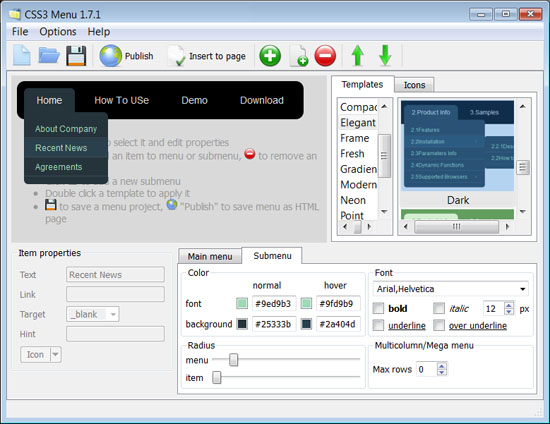 Css menu generator has an intuitive GUI and extensive library of free professional-designed css menu dropdown templates. Css menu drop down maker generate light-weight, cross-browser, SEO-friendly css menu horizontal and support css menu vertical with single and two horizontal levels. Css menu generator saves time!